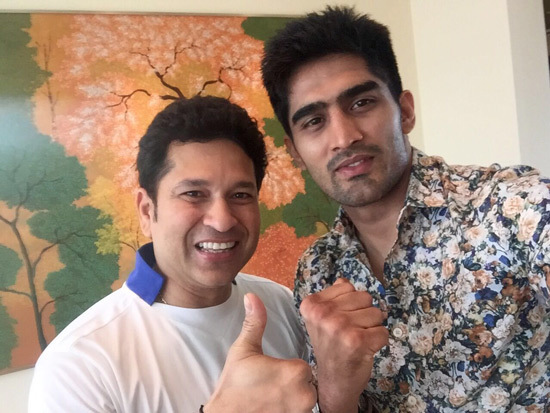 India’s boxing sensation Vijender Singh met Cricketing legend Sachin Tendulkar in Gurgaon. Vijender who is a huge fan of Sachin Tendulkar invited him for his title fight scheduled to be held in Delhi on 11 June. During half an hour meeting Vijender also briefed Sachin about the structure and future of professional boxing. On meeting Sachin Tendulkar, Vijender Singh said “Meeting the legend Sachin Tendulkar is always an inspiration for any of the sportsperson. I would like to thank Sachin Sir for giving me time out of his busy schedule and I have invited him to my title fight scheduled to be held on 11 June in Delhi. I am happy that Sachin follows boxing and he asked me about my training regime of pro boxing. He was happy the way my professional career is progressing, he asked me about the structure of professional boxing in other countries. Meeting him was really a big motivation for me and he assured me of full support for my all future bouts”.